The most common disease in the United States is not what you may think. Heart disease, diabetes, or cancer come to mind, but actually, gum disease is the single most prevalent disease in America. In fact, it affects more people than heart disease, diabetes, Alzheimer's, and cancer combined! About 80% of the population has some form of gum disease, also known as periodontal disease. Gum disease is an infection of the gums and bone that support teeth, and it usually starts early in life and progresses as a person ages. It all starts when plaque hardens into tartar (also called calculus) below the gum line. This irritates the vulnerable soft tissues, and infection can quickly set in. Combined with decaying food particles lodged between the teeth and bacteria emitted by plaque, the infection can spread quite fast. Symptoms are so mild in the early phase that many patients don't recognize them: red, tender, swollen gums that bleed when brushing teeth. As the condition progresses, the gums can recede from the teeth and pockets of bacteria begin to form. 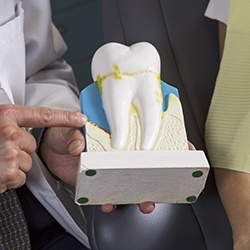 The bacteria can eventually destroy gum tissue and bone, causing tooth and bone loss. Recent research reveals that gum disease is linked to an increased risk for major overall health problems, including but not limited to: stroke, heart disease, respiratory problems, osteoporosis, diabetes complications, low birth weight, and most recently, dementia. Because of these findings, research continues. We may learn much more in the next few years. It all makes perfect sense, though – gum disease is linked to overall health problems. Everything that enters or is present in the mouth has access to the whole body. 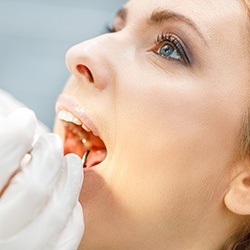 The mouth is like a portal to the body, and that's why regular checkups and hygiene visits are vital to not only your oral health but also your overall health. Unfortunately, gum disease is not curable. However, we can detect early warning signs of gum disease at your regular dental checkups. 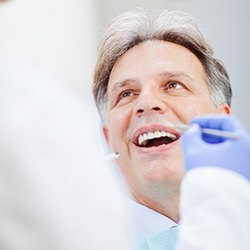 At this stage, management might be as simple as changing your brushing technique, improving your flossing routine, or changing the products you use for oral care at home. 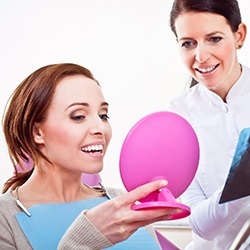 After any of these treatments, expect to attend more frequent hygiene visits so that your dentist or hygienist can monitor your condition and make sure that your recovery is on track. Chronic bad breath is a very common symptom of gum disease, and it can put quite a dent in your confidence as well! Halitosis is a condition that often can’t be handled with standard brushing and flossing, which is why we’re happy to offer a comprehensive system specifically designed to make your breath smell minty fresh. Thanks to this treatment, you’ll have one less thing to worry about during your next date, job interview, or special event!